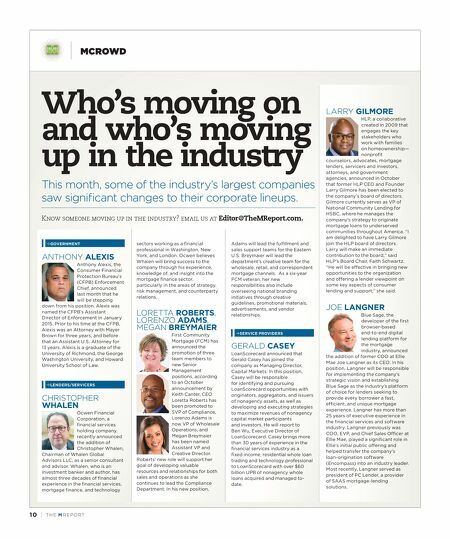 10 | TH E M R EP O RT MCROWD Who's moving on and who's moving up in the industry This month, some of the industry's largest companies saw significant changes to their corporate lineups. Know someone moving up in the industry? email us at Editor@TheMReport.com. GOVERNMENT ANTHONY ALEXIS Anthony Alexis, the Consumer Financial Protection Bureau's (CFPB) Enforcement Chief, announced last month that he will be stepping down from his position. Alexis was named the CFPB's Assistant Director of Enforcement in January 2015. Prior to his time at the CFPB, Alexis was an Attorney with Mayer Brown for three years, and before that an Assistant U.S. Attorney for 13 years. Alexis is a graduate of the University of Richmond, the George Washington University, and Howard University School of Law. LENDERS/SERVICERS CHRISTOPHER WHALEN Ocwen Financial Corporation, a financial services holding company, recently announced the addition of Christopher Whalen, Chairman of Whalen Global Advisors LLC, as a senior consultant and advisor. Whalen, who is an investment banker and author, has almost three decades of financial experience in the financial services, mortgage finance, and technology sectors working as a financial professional in Washington, New York, and London. Ocwen believes Whalen will bring success to the company through his experience, knowledge of, and insight into the mortgage finance sector, particularly in the areas of strategy, risk management, and counterparty relations. LORETTA ROBERTS, LORENZO ADAMS, MEGAN BREYMAIER First Community Mortgage (FCM) has announced the promotion of three team members to new Senior Management positions, according to an October announcement by Keith Canter, CEO. Loretta Roberts has been promoted to SVP of Compliance, Lorenzo Adams is now VP of Wholesale Operations, and Megan Breymaier has been named Assistant VP and Creative Director. Roberts' new role will support her goal of developing valuable resources and relationships for both sales and operations as she continues to lead the Compliance Department. In his new position, Adams will lead the fulfillment and sales support teams for the Eastern U.S. Breymaier will lead the department's creative team for the wholesale, retail, and correspondent mortgage channels. As a six-year FCM veteran, her new responsibilities also include overseeing national branding initiatives through creative guidelines, promotional materials, advertisements, and vendor relationships. SERVICE PROVIDERS GERALD CASEY LoanScorecard announced that Gerald Casey has joined the company as Managing Director, Capital Markets. In this position, Casey will be responsible for identifying and pursuing LoanScorecard opportunities with originators, aggregators, and issuers of nonagency assets, as well as developing and executing strategies to maximize revenues of nonagency capital market participants and investors. He will report to Ben Wu, Executive Director of LoanScorecard. Casey brings more than 30 years of experience in the financial services industry as a fixed income, residential whole loan trading and technology professional to LoanScorecard with over $60 billion UPB of nonagency whole loans acquired and managed to- date. LARRY GILMORE HLP, a collaborative created in 2009 that engages the key stakeholders who work with families on homeownership— nonprofit counselors, advocates, mortgage lenders, servicers and investors, attorneys, and government agencies, announced in October that former HLP CEO and Founder Larry Gilmore has been elected to the company's board of directors. Gilmore currently serves as VP of National Community Lending for HSBC, where he manages the company's strategy to originate mortgage loans to underserved communities throughout America. "I am delighted to have Larry Gilmore join the HLP board of directors. Larry will make an immediate contribution to the board," said HLP's Board Chair, Faith Schwartz. "He will be effective in bringing new opportunities to the organization and offering a lender viewpoint on some key aspects of consumer lending and support," she said. JOE LANGNER Blue Sage, the developer of the first browser-based end-to-end digital lending platform for the mortgage industry, announced the addition of former COO at Ellie Mae Joe Langner as its CEO. 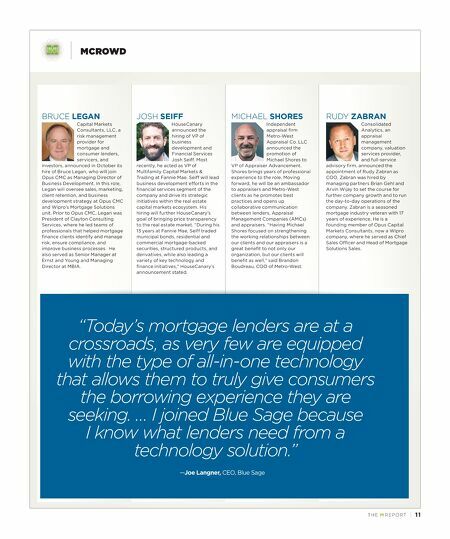 In his position, Langner will be responsible for implementing the company's strategic vision and establishing Blue Sage as the industry's platform of choice for lenders seeking to provide every borrower a fast, efficient, and unique mortgage experience. Langner has more than 25 years of executive experience in the financial services and software industry. Langner previously was COO, EVP, and Chief Sales Officer at Ellie Mae, played a significant role in Ellie's initial public offering and helped transfer the company's loan-origination software (Encompass) into an industry leader. Most recently, Langner served as president of PC Lender, a provider of SAAS mortgage-lending solutions.